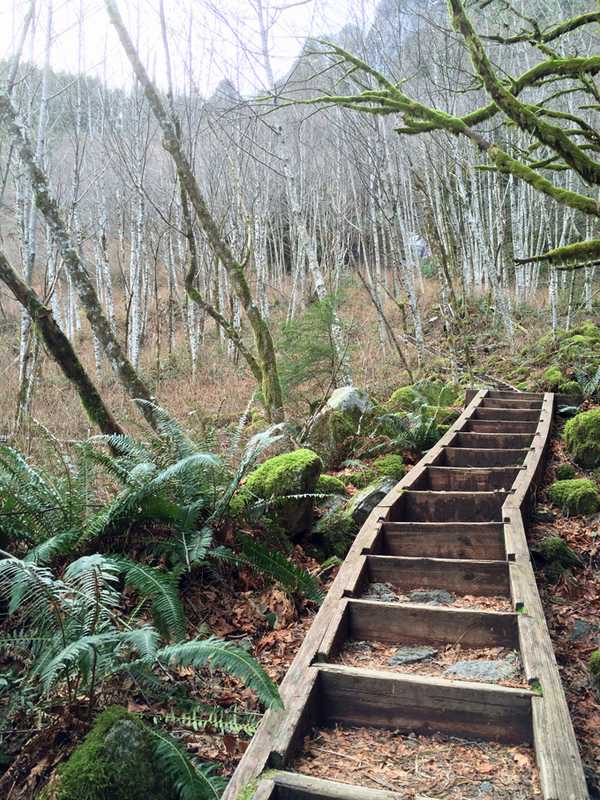 There’s no shortage of hiking trails near Seattle. You can stroll around one of the city’s amazing parks, drive east on the I-90 corridor, and even head northeast toward Stevens Pass. If the central Cascades are your destination of choice — don’t miss Bridal Veil Falls. 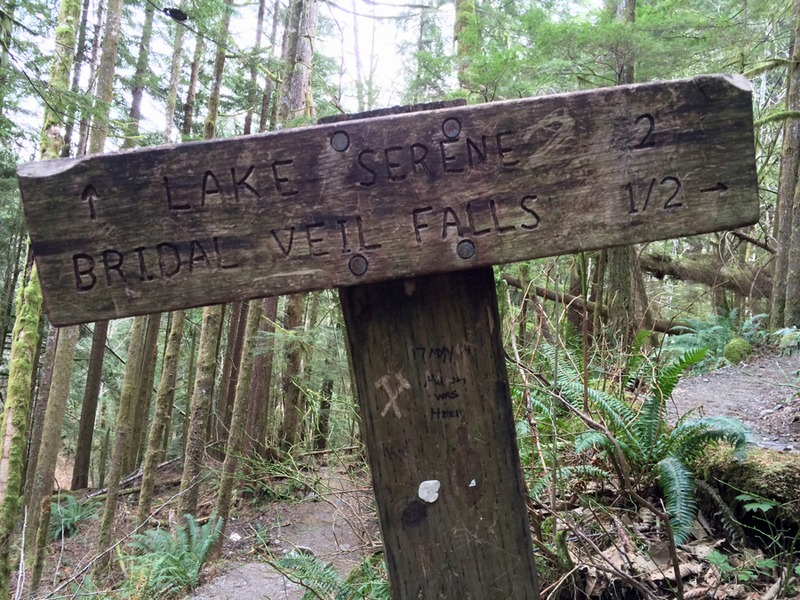 The Bridal Veil Falls trailhead is about an hour 20 minutes from Seattle. Ultimately, you end up cruising east on Highway 2. About 21 miles outside of Monroe, you turn right on Mount Index Road. There’s a parking lot at the trailhead, but be aware that a Northwest Forest Pass is required. 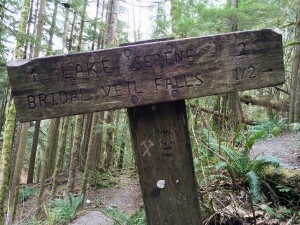 The main signage in the parking lot is for the Lake Serene Trail. That’s the trail you follow until you branch off toward Bridal Veil Falls after about 1.5 miles. Many people will hike up to Bridal Veil Falls, stroll back down, and then continue to Lake Serene for a full day of hiking. When my dad and I visited, we only trekked to Bridal Veil Falls. The round-trip hike to Bridal Veil Falls is only four miles with a 1,000-foot elevation gain. The hike starts on an old, abandoned road. Be sure to follow the signs along the trail to keep you on the right path. The trail widens at about 1.3 miles (again, follow the sign). The trail curves to the right and downhill. Just .2 miles later you reach the sign pointing to Bridal Veil Falls. From there, it’s only .5 miles to reach the falls, but you have to climb a couple of stairways to get there. 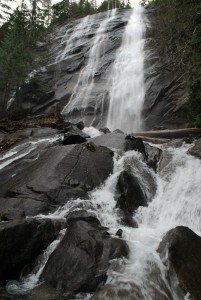 Bridal Veil Falls is a 1,368-foot waterfall that flows from Lake Serene directly into the Skykomish River. As the water initially drops from the lake down the rock face, the stream of water widens and resembles a bridal veil — hence the name. When you reach the falls, there is a lower viewpoint and another spot right at the base of the falls. You can venture off the trail into the waterfall, but be very careful of slippery rocks. 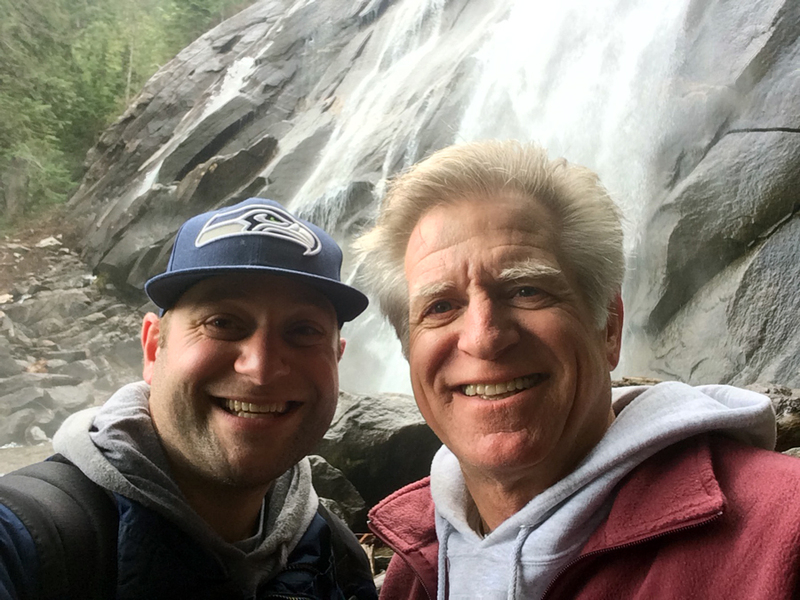 My dad and I visited Bridal Veil Falls in early January. There was no snow on the trail, but thanks to previous snowfall that was melting, the falls were running pretty heavy. We honestly feel like we saw Bridal Veil Falls at its peak. The trail is popular in the summer, but I can’t image the waterfall looking nearly as impressive (due to the drier conditions). If you visit Bridal Veil Falls in the winter, be sure to wear waterproof boots. On top of being near the waterfall, there are several small streams you need to cross/jump over. Your feet will likely get a little wet. Speaking of crowds, my dad and I didn’t run into many folks on the trail to Bridal Veil Falls. Again, it was January and it was a weekday, so we didn’t expect to see many people anyway. Rumor has it the parking lot fills up pretty quickly in the summer, and the trail gets extremely crowded with hikers. If you’re looking for a fairly easy hike with a great payoff, Bridal Veil Falls is a perfect option for you. It’s not exactly a hop, skip and a jump from Seattle, but you don’t have to venture too far to get there. It can be best summed up as a half-day hike (with the drive included). If you have the time, Bridal Veil Falls is totally worth the effort. 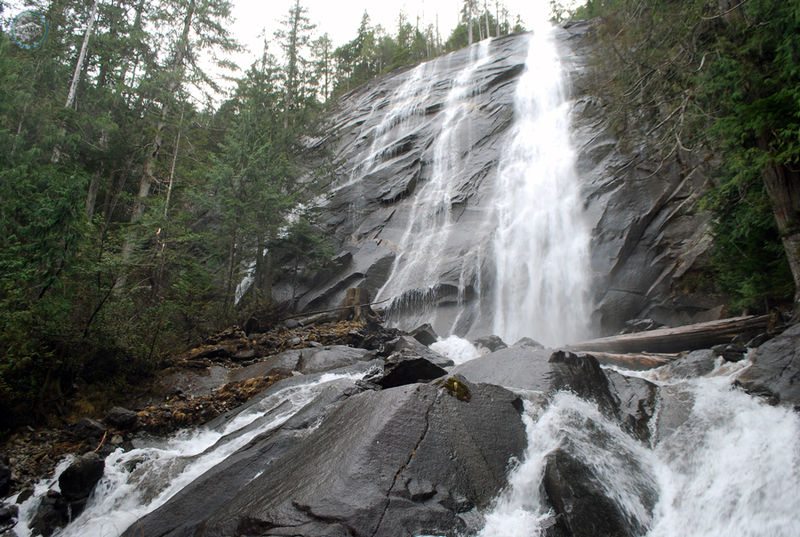 Have you ever hiked to Bridal Veil Falls? How was your experience? We’d love to hear all about it! Please leave a comment below or connect with us on Twitter, Facebook, and Google+. 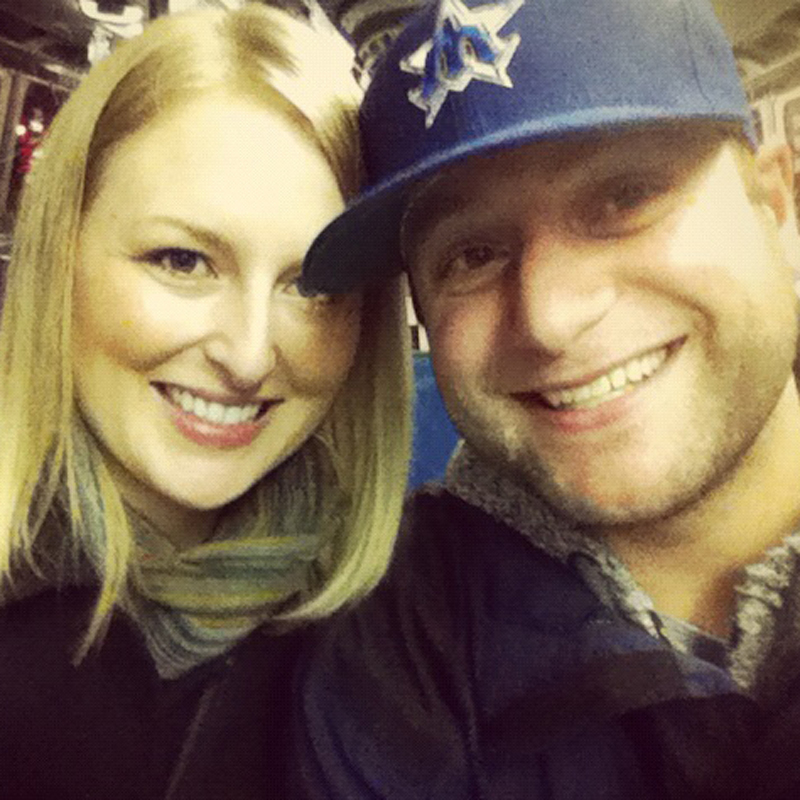 Don’t forget to also check out Seattle Bloggers for more great places to visit around the Emerald City!